Frank Campbell’s rod was bent almost in half and I scurried to grab the video camera as line continued to peel off the reel. Floating down the middle of the Niagara River the way this fish was fighting and taking us into heavy, turbulent current I was sure this was going to make great footage. Lake trout battles are common right now in the Lower Niagara River. With smelt plentiful in the system many lakers have migrated out of Lake Ontario to feed on them. And, anglers targeting steelhead are catching double-digit numbers of lakers on a good day. Steelhead are available too. 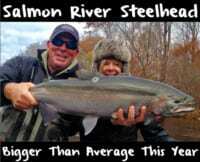 Meanwhile, recent high and blustery water conditions have steelhead more challenging to catch than the lakers. We can thank winds pushing water downriver from Lake Erie for this. The water is slightly off color, too, which isn’t necessarily a bad thing. Campbell doesn’t want gin clear water. That tends to hamper the bite. I was in town to film Pautzke Outdoors with Frank Campbell of Niagara Region Charter Service and Ted Kessler of Rivermaster Charters. The plan was to target browns on the Niagara Bar. However, wind kept us from doing that. Instead, we went upriver to Devil’s Hole and caught so many fish in three hours that we were done in time for lunch. Historically, trips with Campbell and Kessler have been dominated by drifting Fire Brine and BorX O Fire cured eggs fished in sacks. On the other hand, this trip we didn’t have a single egg on the boat. Sure, they are working right now, but something else was fishing better. Instead, we came with dozens of live Chartreuse Fire Dye minnows. The minnows enabled us to target multiple species, although there were so many lakers in the system it was tough getting past their aggression to catch steelhead. When the water clears, nevertheless, the steelhead show better, which was the case a few days later. Edge it did. Campbell and Kessler each caught multiple, quality lakers (and I put the camera down long enough to land a big steelhead) with those above mentioned, live chartreuse minnows, something both have been using for a few months. Campbell has been solely using the chartreuse whereas Kessler is partial to the pink. The Niagara’s spring season is only getting started. The river will be flooded with lake trout, browns and steelhead for the foreseeable future. And, you can bet both, and many others, will have plenty of live Fire Dye minnows in possession. Editor’s Note: Frank Campbell operates Niagara Region Charter Service. For more info on his guided Niagara River steelhead, brown trout and lake trout trips please visit http://www.niagaracharter.com. For more info on Ted Kessler and Rivermaster Charters please visit http://www.rivermastercharters.com. The newest episode of Pautzke Outdoors (filmed on this trip) should be released shortly.